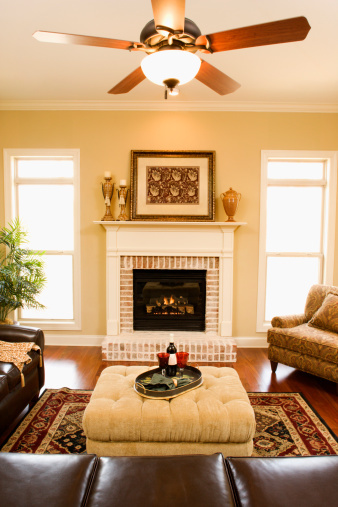 Ceiling fans with light fixtures add illumination to a room while moving the air around your home. The constant rotation of the fan blades and motor sometimes causes the fixture to wobble or shake. This is due to the light fixture or the fixture housing becoming loose. Repairing a loosened ceiling fan light fixture requires knowing where the fixture is loose. Fortunately, there are only two places it can be loose, and each involves only a minor adjustment. Tighten the securing screws to fix a loose ceiling fan light fixture. Find the circuit breaker to the ceiling fan in your home's electrical panel, and turn off the breaker. Position a stepladder under the ceiling fan and remove the bulbs and the globes from the fixture. Depending on your fan, the globes either have three thumb screws securing them to the fixture, or you might have a single globe that unscrews from a threaded housing. Shake the ceiling fan light fixture gently with your hand to determine where the fixture is loose. The bottom half of the fixture fits over a housing with three screws. The main housing connects to the ceiling fan shaft with a 3/8-inch nut. Tighten the three screws around the outside of the fixture housing, using a Phillips-head screwdriver, if the fixture moves when shook but the housing doesn't. Loosen the three securing screws if the light fixture housing seems to shake around the shaft that connects it to the ceiling fan. Gently twist the ceiling fan light fixture counterclockwise and lower it from the housing. Hold the light fixture in one hand without causing strain on the fixture's electrical wires. Tighten the nut on the inside center of the housing where the ceiling fan shaft connects, using a nut driver. Push the ceiling fan light fixture around the housing, with the notches on the fixture fitting around the necks of the securing screws. Twist the fixture clockwise to lock the fixture and tighten the securing screws. Reinstall the globes and light bulbs in the ceiling fan light fixture. Turn on the circuit breaker to power the ceiling fan.